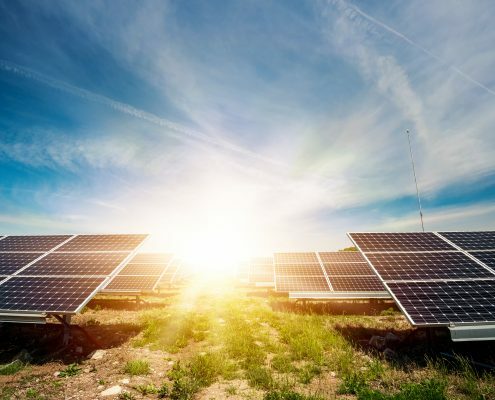 Photovoltaic is our field of expertise, where we offer by means of our qualifications, as professional experts and engineers, the solutions requested by our customers. Whether it is big or small, in open land or on roofs, in Ireland or Jordan, we build highly qualified photovoltaic systems worldwide that fulfil the necessary wishes and requirements. From site selection to project monitoring we are gladly at your service! We are also pleased to offer you construction site managers when needed. We are your Partner for highly qualified renewing and stabilzing. All structures have been optimized by us: highest stability and lightness are combined with outstanding price-performance and usability. We are particularly proud of our substructure, which is erected on top of a row posts and can be set up in any terrain. Due to the special construction and the high-quality workmanship, the structure parts planned and produced in Germany are quickly installed and guarantee a good hold of the modules and the entire system. The standard 22 °, 25 ° or 30 ° tilted arrays can either be set up as individual tables or as an uninterrupted row as for example by large free-field systems. 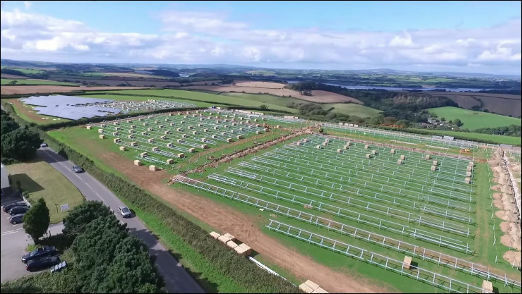 Here you can see the the installation of the stabilization solution in a photvoltaic farm located near Plymouth in the UK: the system has been installed as designed by us. 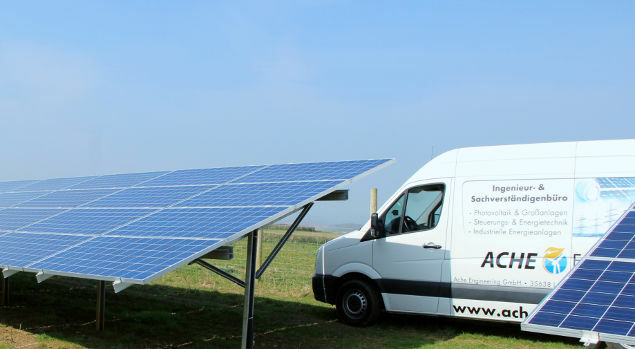 After many years of experience stabilising installed photovoltaic systems, as an engineering company we are proud to continue satisfying our costumers with our unique services, adding especially in 2018 further projects to our list of references. As an example we present a stabilization sytem with an additional post and supporting frames, which can be planned, drawn and also implemented by us. 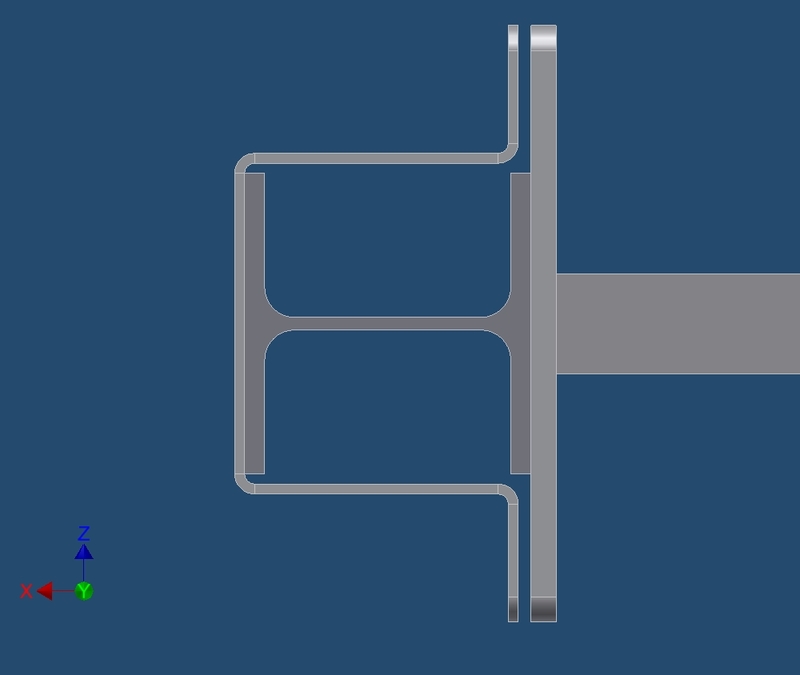 In this CAD drawing you can see the top-view of the bracing, with clamps around the additional earth-driven posts and connected to the existing system. We designed, supplied and installed this stabilization solution most economically and to the absolute satisfaction of our customer. The stability of our new design was analyzed and confirmed by an independent expert. 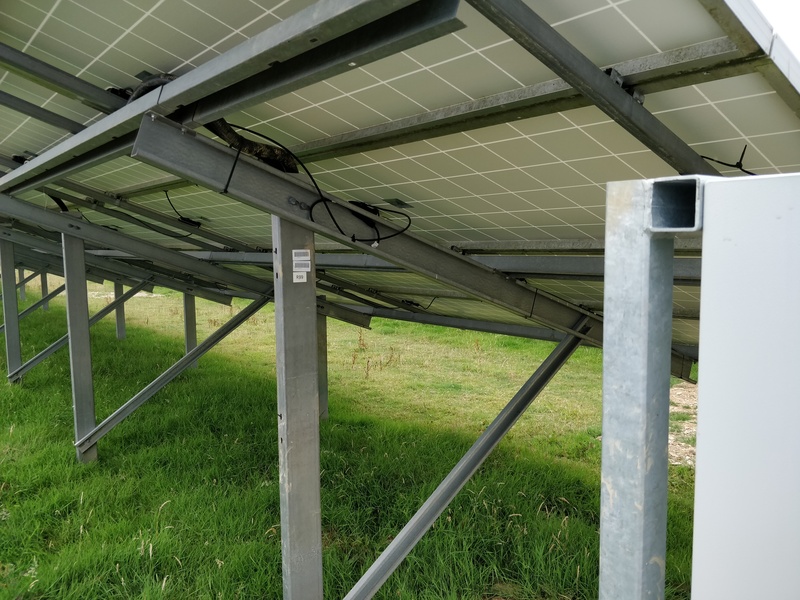 As a specialist company, Ache Engineering installs worldwide cathodic corrosion protective measures for photovoltaic systems. These project-specific measures are often required to protect the structural components of a photovoltaic frame from rosting away. 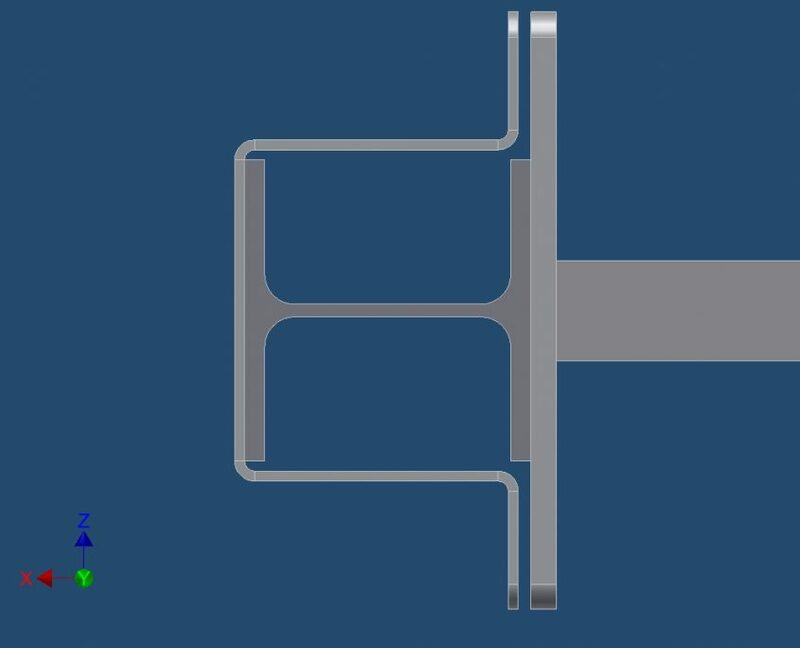 Furthermore, in urgent cases when a fast corrosion process has been identified, jeopardizing the structural stability of the system; it is possible to react fastly and deploy a provisory rescue solution for avoiding further reduction of structural mass and without having much impact on the operation from damage and rust. 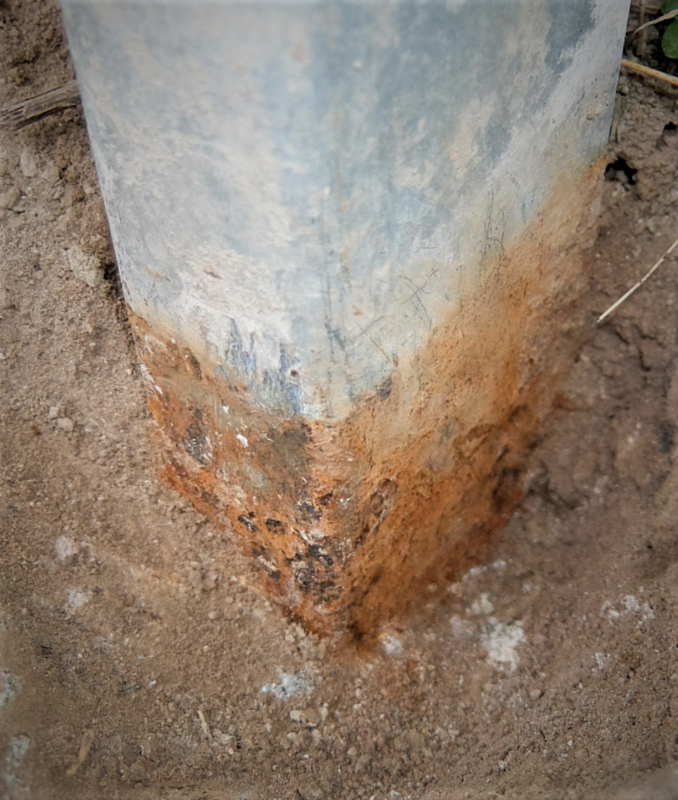 In this case, a fundamental distinction must be made between above-ground and underground corrosion: the most frequent and critical case is the underground anodic corrosion which causes quickly great damage. The necessary protective measures vary from project to project as each installation has its own particular conditions. Due to special soil properties in combination with seasonal environmental conditions or due to the plant electro-mechanical configuration, corrosion will take place affecting the supports and foundations of the PV structures. As the degradation of the the protective zinc layer progresses, some areas of the steel are decovered and this surface starts to get physically exposed to soil and moisture. At those points, the corrosion process gets significantly accelerated by stray currents. This phenomenon can be solved only only with a considerable effort to prevent subsequent damages. The quality or lifetime of the protective solution have to be analyzed from case to case. The part intended to be protected against corrosion will be electrically connected to another piece: the so-called sacrificial anode. 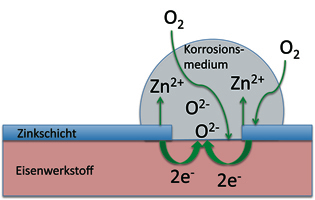 During the process, electrons are exchanged between the two parts and the planned oxidation takes place only at the sacrificial anode. In this way, a cost-effective protection can be implemented easily. And if desired and depending on the soil conditions, it can also protect the parts for over 100 years. 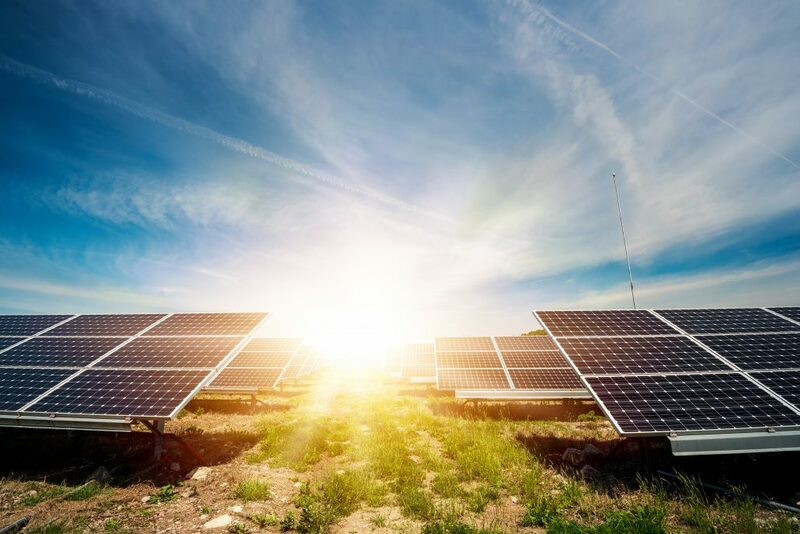 According to the specific environmental conditions of each photovoltaic farm, we use special anodes with a customized sizing and an adjusted current for the entire system. These are introduced into the soil in a so-called anode bed. Ache Engineering GmbH fully implements the solutions briefly described above: it is a very simplified explanation. We are your partner for the protection of industrial infrastructure, tank and offshore installations, pipelines in the water or under ground. We can also plan and perform the protection of reinforced concrete and much more. From planning to subsequent maintenance, inspection and remote monitoring, we take all steps to efficiently protect your facilities against corrosion. 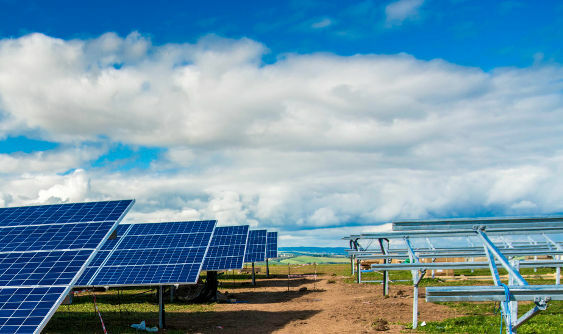 In most of the existing solar parks, the necessary interventions are manageable and we can coordinate them professionally with the operator or owner. Ache Engineering has worldwide experience in the field of cathotic corrosion protection and implements the protective measures from planning to commissioning. As expert engineers we are able to solve complex issues with a self-designed solution, fitting to your demands and conditions. We are your Problem-solver and contact partner. Thanks to many partners and suppliers, we are able to find the solution that you are looking for with a variety of materials and products. Whether it’s a stability or profitability problem, whether an isolated (stand-alone) solution or intelligent energy solutions, as you can see from our references, we are in many areas. Should you have any question regarding one or more of our solutions or concerning another topic, please do not hestiate to contact us or personally have a look at our solutions first-hand at our headquarters.